Countertop materials come in different materials; this makes it challenging for homeowners when making a choice. The most common countertop materials are made from natural stone and especially granite. However, in the modern times, other materials have come up. The options for countertop materials are now limitless. All you need is to make your imagination run the world and even dare and choose a unique material. When choosing a countertop material, make sure that you consider uniqueness, durability, maintenance and other aspects. This is one of the most popular materials for countertops, and it is still a choice for many people. The classic look makes it ideal for almost all kitchen types. Whether you are looking for the traditional and laid back kind of kitchen or you are looking for a contemporary kitchen, granite will always work for you. To maintain the shiny and spotless look, you need to seal it regularly, and this might be a challenge to many people. However, if you take good care of your granite, you kitchen will always look unique, clean and new at all times. Granite is what we can call a classic look when it comes to countertops. Surprisingly, wood is still an option for countertops. Before selecting wood as an option, make sure that you type of wood that can stand all the elements in the kitchen. 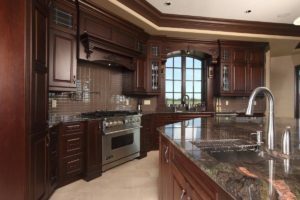 Wood is a very traditional material, and it is ideal for a classic and traditional kitchen. This is because it creates that warm and conservative look that many people like. To maintain your wood countertops and make them look new, all you need is buffing to get rid of scratches as well as regular polishing to maintain the sheen. This is not a very common choice for many home owners although some people are still making the daring choice. Many people assume the stainless steel countertops are best suited for an industrial kitchen or countryside homes. The misconception is not true because, with a modern touch, you can transform the look of anything that you like. One thing that you should like about these countertops is the durability. Once you install them, you automatically forget about them for years. Maintenance is easy but avoids exposing them to bleach with is likely to damage the steel. The glass is a good material for kitchen countertops for people who want an extra edge. Glass is strictly a modern material, and it might not go well with the traditional kitchen designs. When it comes to glass, you can always achieve the color effect that you want. This means that it can always match the color scheme of your home. There are many types of glass available, and this will depend on how much that you are willing to spend. There is the thicker glass which is more expensive to buy but of course, it is durable. Maintain glass is easy, all you need it wipe them and keep the countertops clean. Marble offer a sophisticated look and it is preferred in all kitchen types. Many people may confuse it with granite, but these are different types of materials. If you want to install marble countertops, your service provider may provide the slab which is one big piece or tiles which are small pieces put together. The best thing with marble is the fact that it is timeless but it might require some extra care to keep it clean and neat. To keep a marble countertop in good condition, always avoid harsh chemicals when cleaning. These are the least expensive countertops, but you will require some modification to achieve a clean and neat look. Concrete in itself is not always beautiful but with some modification like fabricating and sealing, you will achieve the look that you want. This is also one of the most durable materials that you can ever find on the market. With concrete, you can achieve different color effects and especially if you pay attention to details in the final touch-ups. The difference in bringing out the beauty of countertops is solely dependent on creativity and details.